Boudins Bistro and Jazz Lounge and Vito’s Wine bar in Delaware have opened their doors to live jazz in the Columbus metro. Vito’s has actually been booking live performances there for the past several months with Boudin’s recently opening on the East side of town. Both venues now host regular jazz performances. Boudins Bistro and Jazz Lounge is an elegant lounge dedicated to Jazz lovers, while also providing good Food, good Music, and good Service with each and every experience. The lounge is open every day and hosts a live jazz jam session on Saturday afternoons starting at 3pm, hosted by Bobby Floyd. 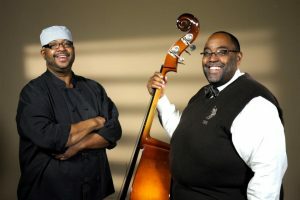 On Sundays from 2-5pm, the lounge hosts a “soulfood buffet” with live jazz. We’re told there will be some other performances in the evenings as the schedule permits. Vito’s Wine Bar has been hosting live jazz for the past several months and continues to book local artists weekly. Jazz performances are every Tuesday and Saturday evening including recent performances by the Twice as Nice Trio, Maxwell Button Trio and The Hayden Huffman Trio. Vito’s is in Delaware, Ohio, just north of Columbus about 30-40 minutes.